EDIT: 50% and 5x still works but you got to wait 5 to 10 weeks for the 50% to come back! Final verdict: No one knows whats going on at AmEx, but points should be coming even when picking the personal card, as long as a business pt is linked. Well, I’ll be damned, another sweet redemption is slowly dying! It’s just like the United MPX for the $200 credit, and 100k leaked link bonuses, and the 50% bonus itself. It appears the RAT is cracking down on the double dipping of benefits and loopholes. I guess some VP fucked up with the 50% idea, and AmEx is looking at some losses this quarter. 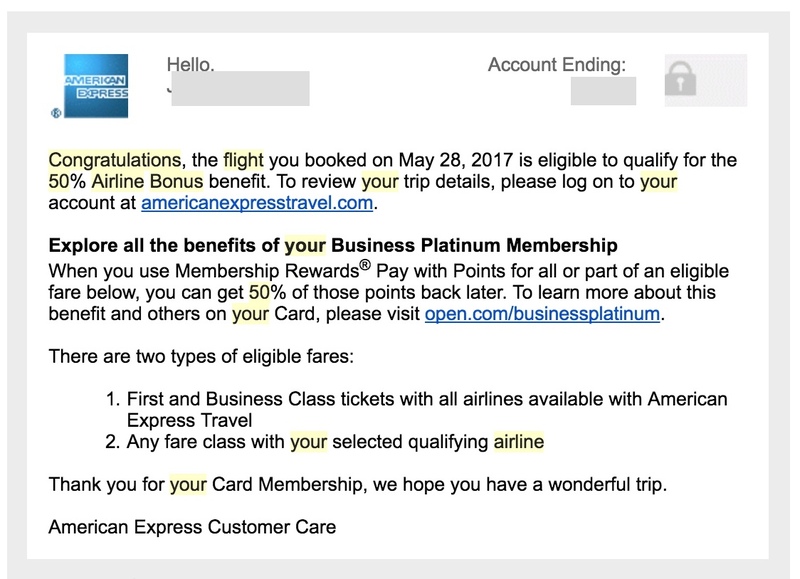 Recap: I booked a flight with points early in April and choose my Personal Platinum Card and got both 5x points as well as 50% back by sheer virtue of having a linked Business Platinum. It appears they are throttling us all back, we have gotten too drunk on our rapid redemptions. The guy on the phone on the 07 June 17 call said there was a bunch of redemptions made before the month was up. Lots of confusion out there, even a datapoint a day before my attempt here buried in the comments says the double dip is over. BEWARE of what card to pick on checkout when paying with points! To use Pay with Points, you must charge your eligible airfare purchase through American Express Travel to a Membership Rewards®program-enrolled American Express®Card. Points will be debited from your Membership Rewards account, and credit for corresponding dollar amount will be issued to the American Express Card account used. If points redeemed do not cover entire amount, the balance of purchase price will remain on the American Express Card account. Points must be used at the time of booking. Pay with Points requires a minimum redemption of 5,000 points. Business Platinum Card Members will receive 3.5 extra points for every 10 points they redeem for either a First or Business class flight on any airline, or for flights with their selected qualifying airline using Membership Rewards Pay with Points through American Express Travel (35% Airline Bonus), up to 500,000 bonus points per calendar year, per each Membership Rewards account. For First or Business class flights on a Card Member’s selected qualifying airline, the Card Member will still receive only 3.5 extra points for every 10 points redeemed. Card Member must select a qualifying airline at www.americanexpress.com/airlinechoice. Only the Basic Card Member or Authorized Account Manager(s) on the Card Account can select the qualifying airline. The airline you select for the 35% Airline Bonus and the $200 Airline Fee Credit must be the same. Card Members who have not chosen a qualifying airline will be able to do so at any time. Card Members who have already selected a qualifying airline will be able to change their choice one time each year in January at www.americanexpress.com/airlinechoice or by calling the number on the back of your Card. Card Members who do not change their airline selection will remain with their current airline. If you select Spirit Airlines, Southwest Airlines, or AirTran Airways, to receive your 35% Airline Bonus you must call Business Platinum Travel Service at 1-800-553-9497. A flight booked as part of a travel package or booked with the American Express U.S. Representative Travel Network is not eligible for the 35% Airline Bonus. In addition, to be eligible to receive extra points, Card account(s) must not be in default at the time of extra points fulfillment. If booking is canceled, the extra points will be deducted from your Membership Rewards account. Extra points will be credited to your Membership Rewards account approximately 6-10 weeks after charges appear on your billing statement. See membershiprewards.com/terms for Membership Rewards program terms and conditions. This 35% Airline Bonus is the maximum Membership Rewards points you can get back for Pay with Points on flights booked through American Express Travel. Bonus ID: A6ZB. NOTHING in the T&C regarding picking any specific card, just any card. So I went ahead and called asking about it, and the customer service rep stuck to her guns, she said despite what is written the automated system will only credit the 50% back if you pick the Business AmEx Plat. I called the Biz Plat CSR and they told me the opposite! I could get 50%, just gonna take me 10 weeks! Best case scenario is I still get my 50% points back stuck in the system somewhere, 3 months from now. Has anyone else out there heard differently?